608. Definition. The recommencement of growth in the seed is called germination. It is the awakening of the embryo from its torpor, and the beginning of development in its parts already formed, so. as to become a plant like its parent. Germination of the Beach-nut 470, Cross-section, showing the folded cotyledons. 471, The radicle only 472, The ascending axis, above c, appears. 473, The cotyledons expand into the primordial leaves. 474, The first true leaves. G09. Experiment. All the stages of this interesting process may be conveniently observed, at any season, by an experiment Let a few seeds, as of flax, cotton, wheat, pea, be enveloped in a lock of cotton resting upon water in a bulb-glass, and kept constantly at a proper temperature. Or, in spring, the garden soil will give us examples of all kinds everywhere. 610. That the seed may begin to grow, or germinate, it is first planted, or, at least, placed in contact with warm, moist soil. Concerning the proper depth of the planted seed agriculturalists are not agreed; but nature seems to indicate that no covering is needed beyond what will secure the requisite moisture and shade. 611. The process commenced. Thus situated the integuments gradually absorb water, soften and expand. The insoluble, starchy matter deposited in the cotyledons, or in the albumen, or in both, undergoes a certain chemical change, becoming sweet and soluble, capable of affording nourishment to the embryo now beginning to dilate and develop its parts. First (in the winged seed of the maple, scattered everywhere) the radicle is seen protruding from the micropyle, or the bursting integument. A section of this seed would now show the folded embryo impatient of confinement. Germination of the Maple. 475, Samara; section showing the folded cotyledons at c.
476 - 180, Progressive stages. 612. The process concluded. Soon the radicle has extended, and, pale in color, has hidden itself in the bosom of the dark, damp earth. Now the cotyledons, unfolding and gradually freed from the seed coats, display themselves at length as a pair of green leaves. Lastly the plumule appears in open air, a green bud, already showing a lengthening base, its first internode, and soon a pair of regular leaves, lobed as all maple leaves. The embryo is now an embryo no longer, but a growing plant descending by its lower axis, ascending and expanding by its upper. 613. What becomes of the cotyledons. 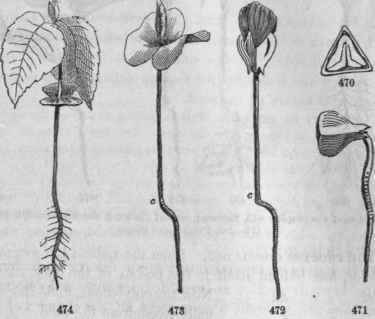 The germination of the tulip-tree, oak, pea, squash, and other Dicotyledons may be watched with equal advantage, and the chief difference observed among them will be in the disposal of the cotyledons. In general, these arise with the ascending axis, as in the maple and bean, and act as the first pair of leaves; but sometimes, when they are very thick, as in the pea, buck-eye. oak (6 - 9), they remain as first placed with the collum (§ 118), neither ascending nor descending. 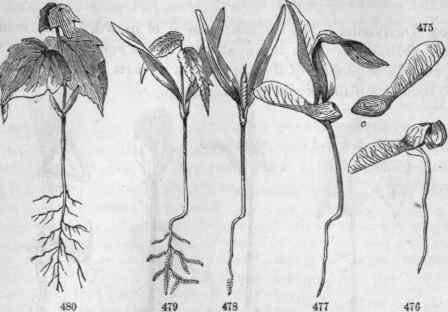 Germination of Wheat; o, the grain containing the cotyledon; c, plumule; r, radicle; a, rootlets (adventitious). 614. The germination of monocotyledons, as seen in Indian corn, wheat, tulip, is in this wise. The cotyledon is not disengaged from the seed, but remains stationary with it. 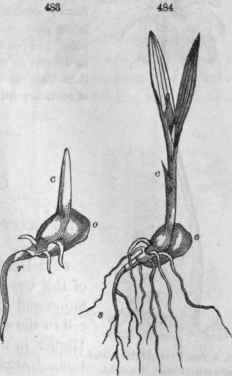 The radicle (r) protrudes slightly and one or more rootlets (s) break out from it and descend. The plumule (c) shoots, at first parallel with the cotyledon along the face of the seed, but soon ascends, pushing out leaf from within leaf. 615. The conditions requisite for germination are moisture, air, and warmth. 616. Moisture is necessary for softening the integuments, dissolving the nutritive matter, and facilitating its circulation. This is supplied in the rain and dew. 617. Air, or rather its oxygen, is required for the conversion of the starch into sugar - a process always depending upon oxydation. The oxygen absorbed unites with a portion of the carbon of the starch, producing heat, evolving carbonic acid, and thus converting the remainder into grape sugar, soluble and nutritive. 618. Warmth is a requisite condition of all vital action, as well in the sprouting of a seed as in the hatching of an egg. The proper degree of temperature for our own climate may be stated at 60° to 80°. Extremes of heat and of cold are not, however, fatal to all germination. In one of the Geysers of Iceland, which was hot enough to boil an egg in four minutes, a species of Chara was found in a growing and fruitful state. A hot spring in the island of Luzon, which raises the thermometer to 187°, has plants growing in it and on its borders. Many species of plants also seem well adapted to growth in the Arctic regions. 619. Darkness is favorable to germination, as proved by experiment, but not an indispensable condition. Hence, while the seed should be covered for the sake of the moisture and shade, the covering should be very thin and light, for the sake of a free access to air. 488, 484, Germination of Indian Corn. 620. The cause of the downward tendency of the ROOT is a theme of much discussion. Some have referred it to the principle of gravitation; others to its supposed aversion to light. But it is a simple and satisfactory explanation that its growth or cell-development takes place most readily on the moist side of its growing point, and consequently in a downward direction, so long as the soil in contact with its lower surface is more moist than that above. Hence also the well-known tendency of roots toward springs and water-courses.